Start off your visit on the 19th (Sat): contemplate in the serene atmosphere at Jakhu Temple, take in the awesome beauty at Kufri Fun World, then make a trip to The Mall, and finally admire the striking features of Viceregal Lodge. Here are some ideas for day two: admire all the interesting features of Indian Institute of Advanced Study, take in the spiritual surroundings of Tara Devi Temple, then take in the architecture and atmosphere at Christ Church, then make a trip to The Ridge, and finally explore and take pictures at Gaiety Heritage Cultural Complex. To see traveler tips, other places to visit, photos, and more tourist information, use the Shimla trip planner. Use the Route module to see travel options from your home to Shimla. Cap off your sightseeing on the 21st (Mon) early enough to travel to Naldehra. 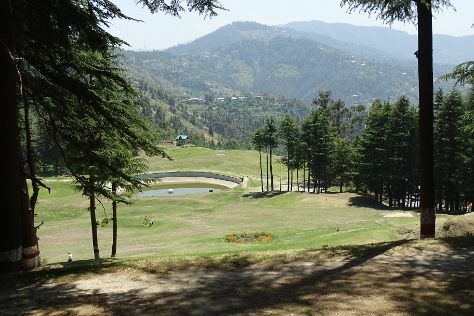 On the 21st (Mon), play a few rounds at Naldehra Golf Course. For maps, more things to do, ratings, and more tourist information, read our Naldehra itinerary website . Getting from Shimla to Naldehra by car takes about 1.5 hours. On the 22nd (Tue), wrap the sightseeing up by early afternoon so you can travel to Manali. Manali is known for nature, historic sites, fun & games, winter sports, and museums. Your plan includes some of its best attractions: admire the verdant scenery at Solang Valley, examine the collection at Museum of Himachal Culture & Folk Art, contemplate in the serene atmosphere at Hidimba Devi Temple, and take in the natural beauty of Vashisht Baths. To see reviews, where to stay, traveler tips, and other tourist information, read Manali trip itinerary planning website . Traveling by car from Naldehra to Manali takes 8.5 hours. You'll have a few hours on the 25th (Fri) to wrap things up before traveling to Dalhousie. Kick off your visit on the 26th (Sat): pause for some serene contemplation at St. John's Church and then take in the awesome beauty at Dainkund Peak. To find other places to visit, more things to do, photos, and other tourist information, use the Dalhousie holiday site . Traveling by car from Manali to Dalhousie takes 7 hours. Alternatively, you can take a bus. Wrap up your sightseeing on the 26th (Sat) early enough to drive back home.